September is that wonderful time of year that merges the warmth of summer with the promise of fall. It is the time of year where the last of the warm weather festivals take place. Around this time last year we attended Naperville’s annual art walk. It is one of my favorite festivals to attend. There is so much to se see and do. Live orchestrated music floats through the air as passerby’s comment on their favorite artwork. The weather was beautiful that day similar to to years past. 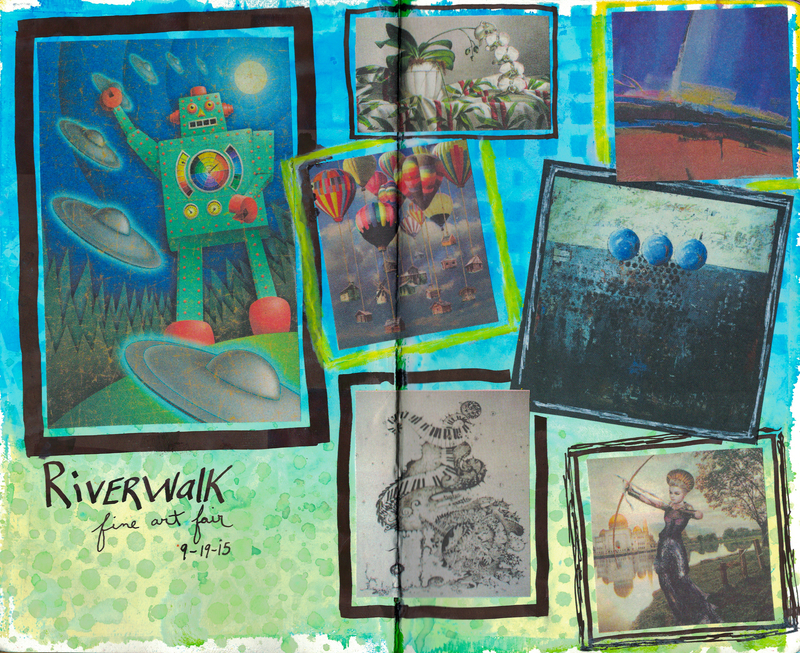 I enjoyed walking the stretches along the Riverwalk seeing all the wonderful art. To capture this event, I did something a little different for my art journal. Instead of drawing out a scene like I normally do, this time I decided I would take small photocopies of some of the favorite pieces I saw in the art guide and make a collage out of them. For the back ground I used Dylusions ink spray and my micron pen I used for the title. Overall this was a wonderful way to capture the day and I will forever have fond memories associated with the event.